The company was summoned by China’s Internet regulators in Tianjin City on Friday for selling images that it held no copyrights to, including the first-ever black hole, logos of multiple Chinese companies, as well as China’s national flag and national emblem. Visual China Group is China’s leading stock image provider that’s often compared to Getty Images. The company made the black hole image available for sale shortly after its release without attributing copyright to Event Horizon Telescope (EHT) project, the planet-scale telescope array that captured the image of the black hole. Visual China has since issued a formal apology for claiming copyright of the pictures and charging for their uses. The company has removed the photos and shut down its website after being placed under scrutiny. The company’s stocks has been trading under roughly 25.2 yuan, a ten percent dive since the incident. “We will learn from these lessons, make rectifications, and voluntarily accept how the Tianjin Internet Information Office’s verdict on the firm,” said Visual China in its Weibo apology. 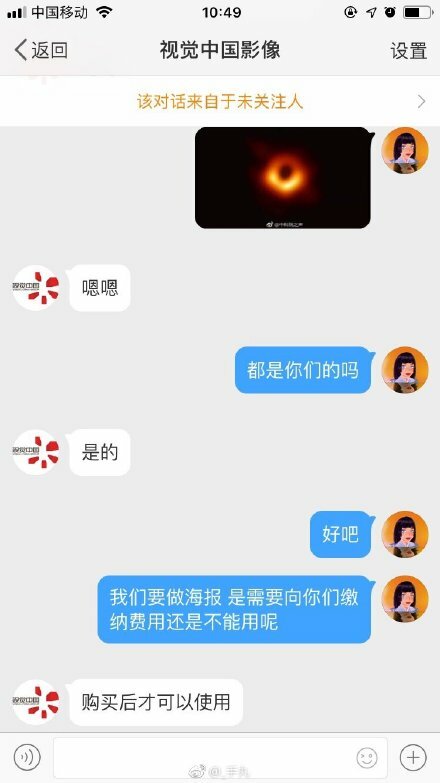 The incident began on Thursday when netizens noticed that Visual China’s has indicated on its website that it held full copyright over the first ever black hole image. Criticisms of the company’s misconduct piled up on Chinese social media within hours after Weibo users posted screenshots of the company confirming copyright hold. The incident escalated after the Communist Youth League of China questioned the company of holding copyright over images of the country’s national flag and emblem, which was found to be among the images that the company claims it had rights to. Topics such as “Visual China apologizes” and “Visual China website offline” quickly became the hottest trending topics on Weibo with over 250 million views. According to its website, now down, Visual China has over 40 million editorial images and 1.25 million videos.